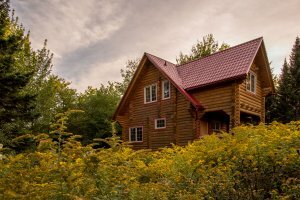 This 5-bedroom, Russian Pine log chalet was built during the spring of 2008. It’s a one-of-a-kind in Nova Scotia. Its spacious floor plan can accommodate up to 16 people. There are two floors (2500 sq. ft. in all), five bedrooms, a large living area on the first floor that can easily double as a meeting room and space for break-out rooms if required. There is a well-equipped, modern kitchen, two powder rooms, three bathrooms, a flat screen TV room and closet space galore. Nightly rate based on an occupancy of 10 (Maximum number of occupants is 16). The two-story, one bedroom chalets have a full kitchen on the main floor, dining area and a large living room leading to the second floor loft. The loft, over the living room, contains the master bedroom, bathroom, and a landing (with sofa bed) leading to a sunny balcony with a cozy table for two. The large windows in each unit offer a constant source of light that provide a country charming warmth to every room. Each chalet is equipped with all the amenities you would expect from a ‘four star’ accommodation facility, including quality bedding, linens, fixtures, furniture and appliances, WIFI, and satellite TV with a large flat screen. Two night minimum stay required when booking on Friday or Saturday during Relax Season (Oct. – May.). 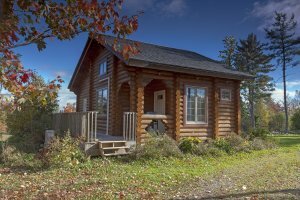 This darling one bedroom, luxury one floor chalet has a charming wrap around deck with outdoor hot tub. Equipped with a kitchen, dining and living room (with sofa bed). The large windows in each unit are a constant source of light that provide warmth and added appeal to every room in the house. 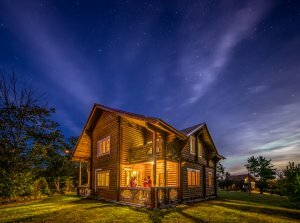 Each chalet is equipped with all the amenities you would expect from a ‘four star’ accommodation facility, including quality bedding, linens, fixtures, furniture and appliances, satellite and flat screen TV monitor. Nightly rate based on an occupancy of 2 (Maximum number of occupants is 4). Click here to view our Russian Pine Chalet Photo Gallery. BBQ’s and propane tanks are provided with each accommodation.